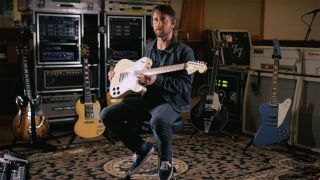 Foo Fighters’ guitarist Chris Shiflett has announced plans to sell part of his guitar collection. He’ll put 20 instruments up for sale online tomorrow (July 19) via Reverb.com – including the 2002 Gibson Firebird V Reissue he played in the Foos video for All My Life. Shiflett says: “I have an excess of guitars that I’ve gotten over the years. I have more than I could even really play and more than I do play. A lot of them sit around our studio and collect dust – and a lot of them are cool guitars. “It would be fun to see these things find a home elsewhere, where somebody’s going to actually play them and put scratches on them. Among the other instruments that'll be up for sale is the Fender Chris Shiflett Signature Telecaster Deluxe Prototype which was sent to him during the early stages of the design process, a 1990s Gibson ‘61 SG Les Paul Custom Reissue, and a Gretsch Brian Setzer Signature Black Phoenix. Watch Shiflett talk through some of the guitars in the video below. Last summer, former Black Sabbath drummer Bill Ward sold more than 200 pieces of equipment, including live and studio gear through Reverb. Foo Fighters are currently on tour across North America in support of their latest studio album Concrete And Gold.